FORT LAUDERDALE, FL--(Marketwire - March 4, 2011) - Break for some fun in the sun and allow breathtaking sunrises, beautiful beaches, fine dining and relaxing spa services to transition your mind, body and spirit for a relaxed and rejuvenated spring getaway. Now an exclusive Fort Lauderdale Beach hotel is offering exciting Seaside Getaway packages that include private beaches, ocean views and resort credits for exhilarating Florida fun. Located on 16 secluded waterfront acres, the Harbor Beach Marriott Resort & Spa is distinctive among Fort Lauderdale hotels on the beach, offering guests a pristine private beach for vacation fun and an exciting Seaside Getaway package that includes a $50 daily resort credit. Guests enjoy luxury accommodations with a complimentary upgrade to an ocean view and can use their $50 daily credit on any of the resort's fine amenities including spa services, room service, fine dining at one of the hotel's three restaurants, including the famed 3030 Ocean Restaurant, or toward drinks and menu items from the 3030 Bar or Starbucks coffeehouse. With rates starting as low as $279*, this Seaside Getaway is perfect for spring break relaxation as guests are close to popular area attractions and exciting water sports. This Fort Lauderdale family hotel's Surf Club also provides exciting adult supervised activities for the kids along with a surf simulator, games, video games and movies. Now is the time to plan a spring break excursion as this great Fort Lauderdale vacation deal ends April 30, 2011. Accommodations for the Seaside Getaway may be booked online by using promotional code NCL at http://www.marriott.com/hotels/travel/fllsb-harbor-beach-marriott-resort-and-spa/ or by calling 1-800-222-6543. 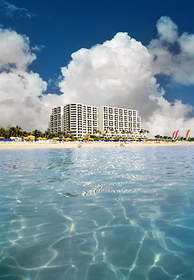 Distinctive among resort hotels near the cruise port in Fort Lauderdale, the Harbor Beach Marriott Resort & Spa offers guests spectacular Atlantic Ocean vistas with sparkling blue waters, white sand beaches and all the amenities of luxury resort accommodations. A variety of spacious guest rooms and suites are available featuring stylish new décor, flat screen TVs and the Marriott's popular Revive bedding. Guests may also take advantage of The Spa at Marriott Harbor Beach Fort Lauderdale for a full line of rejuvenating spa services including special treatments, wraps and massages for added relaxation. *Rates are per room per night and valid seven days a week through 4/30/11 based on availability at the time of reservation. Credit may not be applied to room rate or redeemed for cash. Please see hotel website for additional terms and conditions. The Harbor Beach Marriot Resort & Spa provides guests with an exclusive beach resort vacation experience and a convenient location near prominent Fort Lauderdale destinations such as Las Olas Boulevard, Beach Promenade and Sawgrass Mills Mall. Business and social planners find the hotel's 32 meeting rooms and 40,000 square feet of state-of-the-art event space a premier choice for business conferences, corporate meetings and elegant social events. The resort is nestled on 16 secluded tropical acres on South Florida's largest private beach.